Lacquerized — A blog about nail polish: How to: Unmask the OPI fakes! How to: Unmask the OPI fakes! A few weeks ago I was talking to Daphne from NailSwatches and she gave me a link to this wonderful eBay guide, that showed the differences between real and fake OPI bottles. I know there's been a good deal of drama going on about how it's forbidden to sell OPI online. I'm feeling I'm pretty much alone in this, but I can understand why OPI would want some control over their distribution, there are a lot of fakes going around! Why would you care? If it's a fake, there is no guarantee over the quality and ingredients whatsoever, you might even end up with the wrong ugly color. How can you tell? Well, I can't be sure about the really old bottles since I don't know enough about them, but if you're buying pretty new colors keep the following things in mind. When you're looking at the front of your bottle, pay attention to the following things. Make sure the right font has been used and that it is aligned properly, without being skewed. A lot of times you can tell whether it's a fake or not, by looking at the bottom line. The letter L of mL is always uppercase and the letter 'F' in Fl. is always uppercase. Same goes for Oz, the 'O' is always uppercase. There should be a couple of things on the back of the bottle: The address of the distribution centre in The Netherlands and the address of OPI in the US. Also, there should be four warning signs, always in the order you see in the picture. If this isn't the case, big chance it's a fake. A genuine OPI bottle always has a label on the bottom of the bottle, the only bottles that don't have this are the mini's. There is in fact, always a double, second layer, if you peel the first one off, you should be able to see it. The first label contains information such as the product name, product code, bar code and the 'Peel Here' suggestion. On the back of this first label you'll be able to find the ingredients. The 2nd label has the product name and code aligned in the center, and no barcode. Real OPI, again except mini's, bottles have a serial number engraved, on the side, towards the cap. You can't really see them that well, but they should be there. A lot of online sellers make sure you can't read the serial number anymore, by filing it down. But this doesn't mean they're fake. If the serial number is extremely noticable, good chance it's fake. 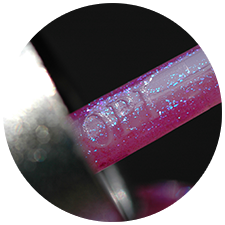 Genuine OPI bottles will have the brand printed on one side of the brush. It isn't that noticable, but if you wipe the polish off, it should be there. Mini's don't have this though. If you find this logo, and it looks a bit weird, fake! Now, this only applies to new OPI bottles, because it appears to be that old bottles are different when it comes to the cap. The inner edge of the cap should be gear shaped, and not smooth. It seems like older bottles do have smooth insides, so if you're not sure, look up the release date of your polish. Polishes from the Designer Series also have this smooth cap! Now, this is a hard one, because you can't always tell right away. OPI bottles always have two steel balls in the bottle! If there's more or less, it's most likely a fake. If you're doomed and your polish is quite thick, goopy or opaque (well, that a plus, I admit), it may be hard to spot this, but if you're 'lucky' enough to own a sheer, you immediately can see this by tilting the bottle to the side. Some OPI bottles come with a plastic seal on the cap, that says "Exclusive ProWide Brush". Not all OPI bottles come with this seal, so if you spot an etailer or eBay seller only selling bottles with this seal, they're bound to be fake! Please note: this information applies to the new OPI bottles, I can't be sure about the older ones. About the labels, there is a wide variety of labels out there, so if your labels look different that doesn't necessarily mean they're fake. A lot of OPI's different lines, like the Designer Series or Suedes have different colored labels, as you can see in the next picture. There might be even more for all I know! Edit: Ainnir found out that green labels doesn't necessarily mean the polish is b3f, read all about it here! I saved the best for last, let's have a look at some awesome older, maybe fake, bottles. These pictures also show that all the above mentioned rules don't necessarily apply to (really) old bottles. Even though I'm not sure about their fakeness have a look at these pictures, Natasja sent me! Some watchful readers commented saying older bottles do only have 2 or 3 warning signs on the back and that all bottles from the mid-90's-ish or before will have the Paris / Los Angeles / Roma on them! The OPI on the brush appears to be a fairly recent development as well. These two bottles still look suspicious though! Do you happen to have some fakes? Link to the original eBay guide and special thanks to Natasja/MooiDonna for her amazing pictures!